Givenchy Vinyl Collection For Fall 2015 | Top Beauty Blog in the Philippines covering Makeup Reviews, Swatches, Skincare and More! The Givenchy Vinyl Collection makeup look for autumn is an haute couture ode to vinyl, a luxurious and sensuous material that becomes an object of fantasy when it clings to the body. The Vinyl Collection’s rich array of colour and texture comes to life on the skin, each lacquered finish gleaming with radiant seduction. A fashion-led fantasy of light out of shadow. 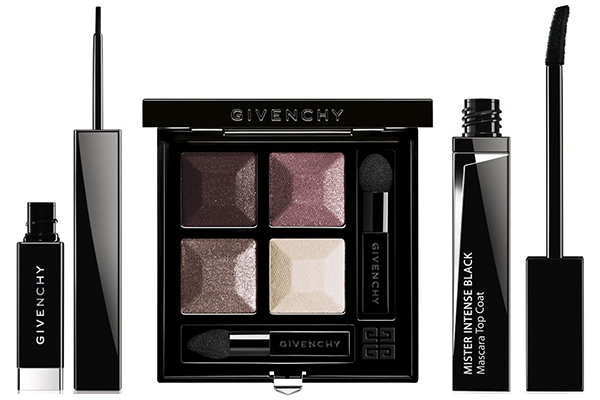 Ultra-modern yet sophisticated, Givenchy presents timeless mirror-like brightness for eyes, lips, cheeks and nails. GIVENCHY LINER VINYL - An intense fluid lacquer that defines the eyes with a vinyl sheen for sophisticated radiance. This expert and ultra-precise liquid eyeliner results in a highly pigmented unique texture. Its extra-thin brush allows you to create whatever look you desire, from a full to a slender line, in a pure and extra-shiny black. GIVENCHY VINYL PRISME QUATUOR METALLIC REFLECTION - Givenchy customise the classic Prisme Quatuor for the 2015 Autumn-Winter Collection in a surprising palette of high intensity colours with elegant metallic reflections.In a timeless yet ultra-modern case is hidden a mysterious and delicate harmony made up of one matte shadow and three metallic shades that reflect light like a mirror to amplify colour. These intense yet complementary shades blend seamlessly together for a perfect autumnal look that offers shine and definition. GIVENCHY MISTER INTENSE BLACK TOP COAT MASCARA - This ink for lashes intensifies eyes without a thickening effect. Your lashes are enhanced with a beautiful black vinyl effect, gaining intensity for a high definition result. Much more than a mascara turned into a top coat, Mister Intense Black offers a new way of working with texture. Its unique, soft and velvety wand ensures easier application right to the lash roots and allows for touch-ups throughout the day. In one gesture, this Top Coat mascara gives your lashes a lift. The colors are so pretty and bold! Great review. That eyeshadow quad! Wow, so pretty! It definitely has an Autumnal feel to it! I love your selection, especially the mascara! amazing collection! love the frist pic! Gorgeous! I love the shadow colors! The mascara is calling my name. I love that eye palette! Omg! Amazing shades! I want this palette! Those colours in that palette, wowza, they're so gorgeous! In love with this collection!!! Givenchy is always so elegant. Love this! OMG! I just bought a ton of makeup from Sephora a few days ago and now I am tempted to buy more! Thanks for the introduction - it seems wonderful! Many thanks, this is helpful :) Happy weekend for you! Love Givenchy, their mascara is really good.